Character Bio's for my 'Immortal Warriors' series starring Torvald and Victoria Svensen, their family and a few of the recurring special guests. A picture of Torvald and Victoria done by Burningfox. Thank you! 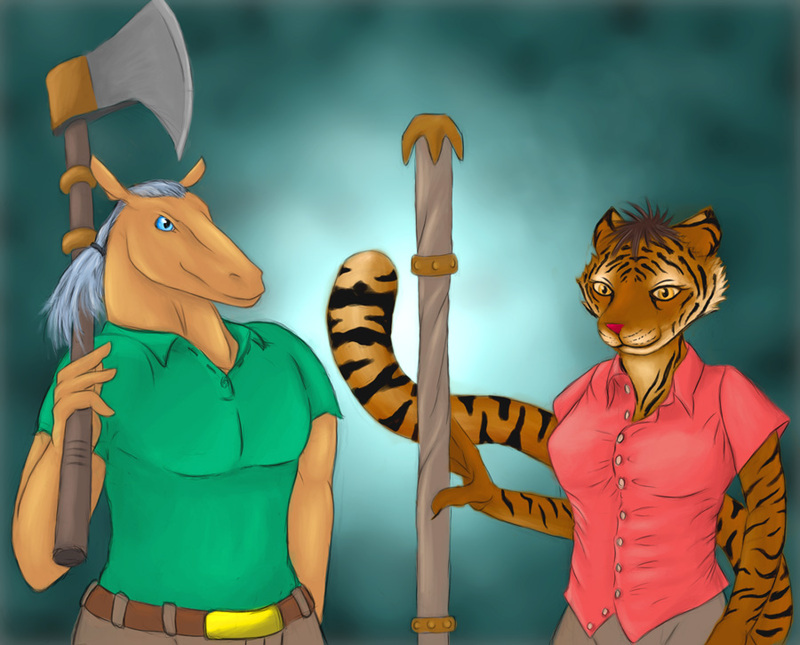 A Voice From The Past This is a completed (for now) furry fan fiction work that includes the character Aslaug Larsdatter that is the intellectual property of Joan Jacobsen. I would like to extend my special thanks and gratitude to the filly herself for helping me with this short story. Feel free to comment on it using the link below. Thanks for reading. 'Lost' This is a story that was part of "A Voice From The Past" that I removed for personal reasons. After closer inspection, I decided it would make a great story in itself. The time line for this story places it about a year after Chapter 8 of "Voice" and it includes a few characters from the original story. I hope you like it. 'The Price Of Worship' This is a story in the ongoing saga of Torvald and Victoria Svensen. This story occurs shortly after the mission from the story "Lost." The place and time that the story starts is a parallel world 1897 Anderson, Indiana where the immortal couple are sent by the gods to straighten out things. what seems like a routine mission becomes much more than that as the mission progresses. You are bound to see a few familiar furs in this story and a few new ones, too. Please read on as we follow them through "The Price Of Worship." 'A Loss Of Rights' This is a story in the ongoing saga of Torvald and Victoria Svensen that occurs after "The Price Of Worship." The immortal couple agree to take an emergency mission that turns out to be far more than wnat was told to them. Once this story is over, there will be Hell to pay and there will be a certain tigress there with her paw out to collect in spades. 'End Game' This is the fifth story in the ongoing saga of Torvald and Victoria Svensen that occurs after "A Loss Of Rights." The immortal couple have a run-in with a legal system that threatens their very existence. Stay tuned for the penultimate saga. 'Redemption' This is the sixth story in the ongoing saga of Torvald and Victoria Svensen that is actually a continuation of the story "End Game". The immortal couple faces a new and very terminal threat to their lives and the continuing existence of their family, too. 'Scribe' This is a new story arc, written in a non-Sabrinaverse world that is not too different from ours. There will be aliens, family values and the occasional soul searching. The story begins in the sleepy city of Auburn, California, some years after the United States fought a stalemate war against China over the rights to drill for oil off the coast of Unalaska, Alaska. 'The Trap' This is a completed (for now) story about two sentient beings that work as purchasing agents for a millionaire. They are sent on what was supposed to be a routine business trip only to have things go sideways on them. This work is not a furry tome but rather it is a mix, I suppose. I have recently authored a novel, 'Destiny's Change', ISBN 1-60474-167-8 that has been put into print by Publish America. Just to let you know, my novel is available through The Raccoon's Bookshelf, Publish America's Online Bookstore and Barnes and Noble Online. I beg you not to use Amazon.com as they have been playing the 500 pound gorilla towards my publisher. Last Updated: Wednesday, 21 January 2015 @ 0920 hours, Sir!